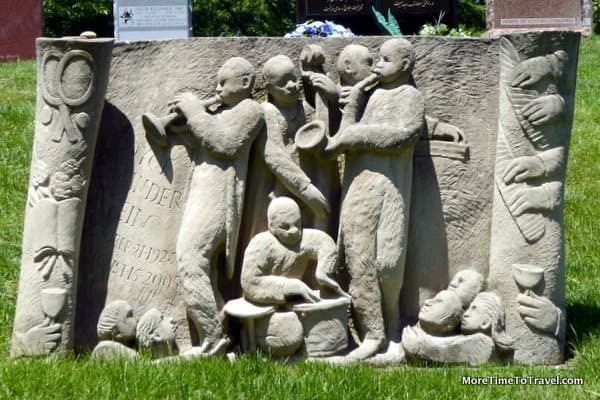 While recently researching a story on cemetery tourism, we found this gem for jazz lovers. The flowering trees and landscaping at Woodlawn Cemetery in the north Bronx are so magnificent that it’s often called an oasis in the city. Located only one-half hour from Manhattan and accessible by public transportation, the sprawling 400-acre park-like setting has 1300 mausoleums and 300,000 people. Founded in 1863, the gravestones in the 150-year-old cemetery read like a virtual Who’s Who of people whose names are etched into American history, such as F. W. Woolworth, Joseph Pulitzer, mayor Fiorello LaGuardia, Herman Melville, Augustus Julliard, Irving Berlin, and suffragist Elizabeth Cady Stanton, to name but a few. However, one of the cemetery’s most remarkable intersections is unofficially called Jazz Corner. Here, in the southwest section of the cemetery, some of America’s greatest jazz musicians have reunited for what you might think of as their last jam. The focal point of Jazz Corner is the grave of Edward Kennedy “Duke” Ellington. In 1959, Ellington visited Woodlawn looking for a gravesite for his parents and selected a dignified spot under a big Linden tree, with enough room for a sizable statue of a cross on each side of the tree. When the Duke passed away in 1974 after an illustrious musical career spanning 50 years, his daughter arranged for his burial in that family grave. According to an article in the New York Times, the Duke had chosen that specific location because of its proximity to the resting place of cabaret singer Florence Mills, whom he memorialized in the song ‘Black Beauty.” Ella Fitzgerald sang at Ellington’s funeral at the Cathedral of Saint John the Divine in Manhattan before he was brought to Woodlawn. Then Miles Davis followed his idol. Because of his admiration for the Duke, the jazz trumpeter secured a gravesite just across the road. The trumpet etched on Davis’ gravestone faces down, in silence, in stark contrast to its characteristic upright position, which was his trademark on stage. The graves of Lionel Hampton (with the epitaph Flying Home) and of Jean Baptiste Illinois Jacquet round out the corner that has become a magnet not only for jazz musicians and disciples but also for jazz aficionados. Jacquet’s nine-foot tall granite tombstone shows him playing his sax on top of a polished black stone that’s shaped like a baby grand piano. Other celebrated jazz stars at Woodlawn include Queen of Salsa Celia Cruz; drummer/percussionist/civil rights activist Max Roach; and saxophonist Jackie McLean. All are buried close to Jazz Corner. Cruz is quoted as having said, “There is nothing that makes me feel better than to be with my public.” Even after death, her mausoleum is one of the most visited in the entire cemetery. Many jazz musicians who have passed away without sufficient resources for a proper burial have found resting places at Woodlawn, too, because the jazz community has honored the memory of its beloved by giving back. For example, Duke Ellington’s sister, Ruth, arranged the funeral for Ada “Bricktop” Du Conge, who helped Duke get his start. While visiting the cemetery, we learned that as one of the cemetery’s community outreach initiatives, Jazz at Lincoln Center Orchestra (led by Wynton Marsalis) performed to an audience of 2000 visitors on the cemetery lawn on a summer evening last year. The souls of the jazz royalty resting in the neighborhood must have been all ears. Read more about Woodlawn Cemetery from Lehman College. The nonsectarian cemetery was designated a National Historic Landmark by the National Parks Service in 2011. A novel free app (available for both Apple and Android phones) showcases the range of prominent people buried at the cemetery. One of the many tours included on the app is a self-guided jazz tour identifying the interment locations of more than 30 jazz greats buried at Woodlawn, along with biographical information and video and music clips. Well, you certainly taught me something totally new. Fascinating! I learned so much, too! Irene, I’m learning too. I never knew “Cemetery Tourism” was a thing. It certainly puts a different spin on cemeteries, places I connect with so much sadness. They are very spiritual places….but also more than that!